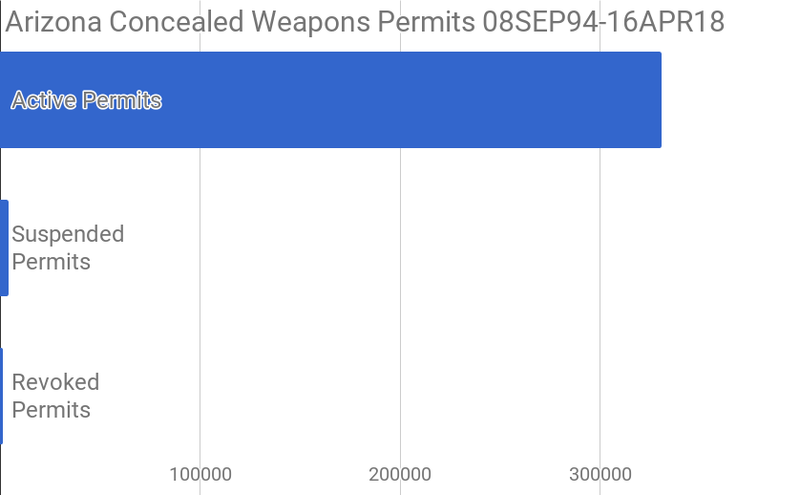 Since first starting their Concealed Weapon Permit program on 08SEP94, Arizona has issued 330,776 permits that are still active, while only 4,189 have been suspended and 1,209 have been revoked. In other words, over the course of the past almost-24 years, Arizona’s CWP has only had a “failure rate” of 0.366%. To put things in perspective, in 2016 Arizona had a total felonious crime rate of approximately 3,819.5 per 1000,000 residents. Given that Arizona’s felonious crime rate peaked at about 5,174.9 per 100,000 in 1991, it is quite acceptable to state that the average Concealed Weapons Permit holder is at least 10 times less likely to break a serious law than non-permit-holders. I keep trying to find new ways to re-word these posts – beyond the obvious state and statistics changes – because Google hates repetitive content. But I honestly can find only so many ways to say, “The average concealed carry permit holder is significantly more law-abiding than average non-permit-holders.” And this only makes sense – concealed carry permit holders are background-checked when they get their permits – indicating a lack of criminal history – and know that any minor slip-up will cost them their permits. But people still treat these statistically-more-responsible as social outcasts, even “safety risks”. I suppose this just goes to show that “gun control” is not based on facts, but rather hysteria. It has been a while since I wrote one of these posts, but since the usual suspects are presently losing their minds at the thought of background-checked, trained individuals peacefully carrying firearms – when those usual suspects already entrust their children to these individuals for up to eight hours a day – it seems time to do another. In the same time window, only 2,092 permits have been suspended, and only 1068 have been permanently revoked. In other words, over the 20 years that Louisiana has had a Concealed Handgun Permit program, they have had a failure rate of only ~0.836%. Comparatively, in 2016 Louisiana had a total felonious crime rate of approximately 3,863.8 per 100,000 people. Considering that Louisiana had a crime rate spike in, coincidentally, 1996 at 6,838.8 felonies per 100,000 people, it is entirely reasonable to state that Louisiana Concealed Handgun Permit holders are at least four times less likely to break a serious law than non-permit-holders. To bring this all back around to the current topic of debate, Louisiana is a state where school districts can allow teachers who are willing to carry firearms. Tennessee and Florida also allow districts to decide, and Utah and Texas already have armed teachers in classrooms… and if you look at those older posts, you can see how much of a non-issue this is. Well, you cannot honestly accuse me of burying the lede, but I will admit that the posts here are getting a touch repetitive. In 2015, Utah revoked all of 1008 licenses, and had 212,349 active permits in residents’ hands at the end of the year. Given that, Utah’s “failure rate” with permits was approximately 0.475%. On the other hand, in 2015, Utah had 3,216 violent and property crimes per 100,000 residents. 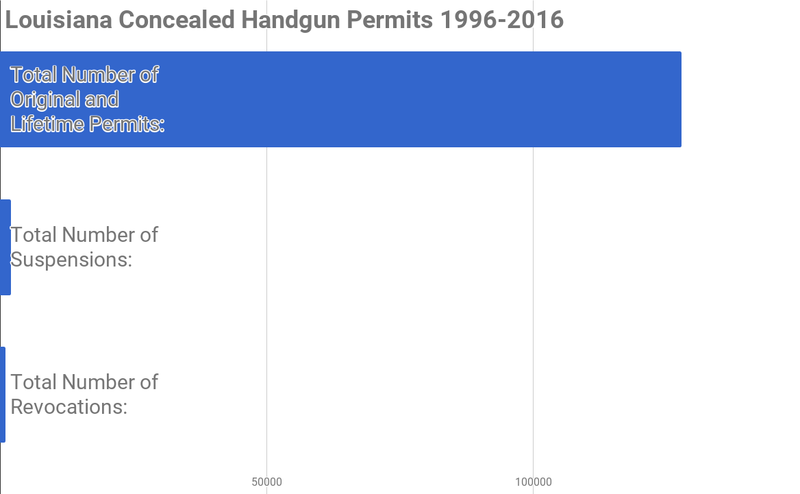 Based on those numbers, it is entirely rational to conclude that an average Utah Concealed Firearm Permit holder is at least six times less likely to break a significant law than an “average” Utahn. I am sure that surprises… no one. I am very thankful that so many states make a point of publishing generic data regarding their license to carry programs. Yes, Texas did, in fact, revoke some permits in 2015. But are you starting to see a pattern for the relative numbers? Regardless, in 2015, Texas revoked a grand total of 880 licenses. On the other hand, there were 937,419 licenses active that year. Once you run the numbers, Texas had a failure rate of 0.094% with their Licenses to Carry a Handgun. Comparatively, Texas had a total violent and property crime rate in 2015 of approximately 3243.6 per 100,000 people. So, in a conclusion that surprises absolutely no one, Texas License to Carry Handgun holders are at least 30 times less likely to break a significant law than an “average” Texan. At this point, I do not think anyone would blame you for noticing a trend. This post is going to be a little different than its predecessor, simply because Tennessee does not track the total number of Handgun Carry Permits they have issued over time; however, the premise is still the same. Again, you will have to take my word that yes, some permits were revoked in 2015. That year, 529,661 people had active, current HCPs in Tennessee, while only 291 were revoked. In other words, Tennessee enjoyed a 0.055% failure rate with their Handgun Carry Permit holders. On the other hand, Tennessee had a total violent and property crime rate of approximately 3,548.3 per 100,000 people in 2015. In other words, it is entirely reasonable to say that, in 2015, Handgun Carry Permit holders were over 60 times less likely to break a major law than “average” Tennesseans. You know, it is starting to look like all the perseverating hysteria about background-checked, trained, law-abiding Americans peacefully carrying firearms in public is… completely groundless. You might have to take my word for it, but there really is a bar to go with “CWFLs Revoked and not Reinstated”. The “problem”, so to speak, is a matter of scale. From 01OCT87 to 31MAR17, Florida has issued 3,518,256 Concealed Weapon or Firearm Licenses – their version of a “concealed carry permit”. As of 31MAR17, 1,747,635 of those licenses are still active. Likewise, as of that date, 11,916 permits had been revoked, but 1,048 of those revoked have been reinstated leaving a total “revoked but not reinstated” of 10,868. In other words, out of the literally millions of permits that Florida has issued over the past almost-30 years, they have had a failure rate of only 0.309%. On the other hand, in 2015, the total violent and property crime rate (since any felony alone is sufficient to get a license revoked, not just a violent crime) in Florida was 3,275.1 per 100,000 people. Given that the total violent and property crime rate in 1988 were 8,937.6 per 100,000 people, it is entirely reasonable to state that Florida Concealed Weapon or Firearm License holders are at least 10 times less likely to break a serious law than “average” Floridians.